What's the Minimum Equipment I Need to Start Podcasting? So you really want to start a podcast. You’ve got something of value to say, and you can think of countless topics in your niche that you’d like to cover. There are just two problems – you have little or no knowledge about audio equipment, and little or no budget. So does this mean that your podcast is dead in the water before it has began? Absolutely not. It’s easy to be intimidated by pictures of recording studios, mixing desks, and cables running everywhere, but you don’t need any of that to start or run a podcast. In this article we’re going to go over some of the most simple and low cost options available to podcasters today. If you’ve felt stuck in a rut with this for a while now I’m hopeful we can find a way for you to kick on and launch your own show. So let’s start with perhaps the easiest setup. Your phone is probably one of the most expensive bits of kit you own, and it can double up as your podcast microphone too. Sure, it might not sound as good as a studio condenser mic, but most phones have pretty decent mics built into them nowadays. To record a podcast with your phone, it’s simply a case of finding your ‘voice memo’ or ‘voice recorder’ app and you’re ready to start your first episode. Once you’ve recorded, you can email yourself the audio file, or transfer it to your computer via a USB cable. Once on your computer, you’ll want to run the audio file through some editing software like Audacity, before uploading your finished episode to a media host. We’ll talk more about these two things later on in the article. If you’re looking to stick with your phone, but you want a better sound quality and a bit more recording flexibility, then there’s a few options out there. The iRig Mic Cast is compatible with most Android devices, as well as iPhones and iPads. At £25/$25 it’ll add an extra quality to your recording without breaking the bank. It simply plugs in to your phone’s headphone port and off you go. If you like the idea of the iRig Mic Cast, but you’d rather have a more traditional looking mic that you can use in a stand with a pop shield, then take a look at the iRig Mic Handheld. At £35/$40 it’s slightly more expensive than the Mic Cast, but also a fair bit more flexible. Just like the Mic Cast though, you simply plug it in to your phone’s headphone port and you’re ready to record. The Rode SmartLav + will plug in to virtually any mobile device. At £42/$70 it’s a little more expensive than the iRig Mic Cast, but you might find a lav mic more comfortable to record with. Lav mics (also known as collar or lapel mics) pin to your shirt, and are commonly seen on TV. They can help you feel more comfortable and natural if you’re someone who struggles to talk whilst staring into a microphone. Microphone veterans Shure recently entered the “plug & play” mic arena with their MOTIV range. The one that really caught my eye (and ear) here was the MV5 (£100/$100). This mic works as a USB, iPad, or mobile (iPhone) mic, and it has a really good level of sound quality too. The Zoom iQ5 (£50/$70) is similar to the iRig Mic Cast, but with many more recording options, though it only works on iOS devices. It plugs in via the lightning connector and gives you the additional option of using Zoom’s free Handy Recorder app to record your podcast episodes. You can use the iRig Mic Cast or the Zoom iQ5 with your iPad. The Rode SmartLav + is only designed for smartphones however. If you like the sound of using a lav mic though, the ATR3350 will plug into your iPad, and it’s even cheaper than the Rode SmartLav +. We’re going to talk about USB mics next, and you can plug a USB mic into your iPad via a ‘Lightning to USB’ adapter if you’re looking for something a little bigger than the devices we’ve covered already. The beauty of USB mics is that they are virtually ‘plug in and play’ (or plug in and record, as our case might be) if you’re using a computer, laptop, or Mac. Connecting a USB mic is no harder than connecting a pen or flash drive. Let’s have a look at the best entry level USB mics out there right now. The Samson Q2U is my personal favourite ‘starter’ mic. It’s very affordable at the price of £44/$42, and that includes some extra accessories such as a table stand and set of headphones. It also has an XLR connection, so if you ever wanted to upgrade to using a mixer in the future you wouldn’t need to buy a new mic. Depending on what region you’re in, you might need to look at the Q2U’s “twin”, the ATR2100. The Blue Snowball comes in two forms. The regular model, the the downsized iCE model. The iCE is marketed by Blue as being designed for “basic recording and Skype calls” whilst the regular model is for “studio quality vocals and podcasts”. At time of writing, prices are around £65/$70 (regular) and £43/$49 (iCE). The Snowball is a nice looking microphone with a good screw-in stand. I’m not keen on the fact that it doesn’t have a headphone port though, so you can’t hear yourself as you record. I also don’t think it sounds as good as either the Q2U or the Yeti. The Blue Yeti is the big brother of the Snowball. At £100/$125 it’s more expensive, but it also has a few more options and a noticeable jump in audio quality. Like all Blue mics it’s a nicely designed piece of equipment, and comes on a great desk stand (which you can remove if you want to attach it to something else in the future). The Blue Yeti is one of the most popular podcasting mics in the world, and with good reason. 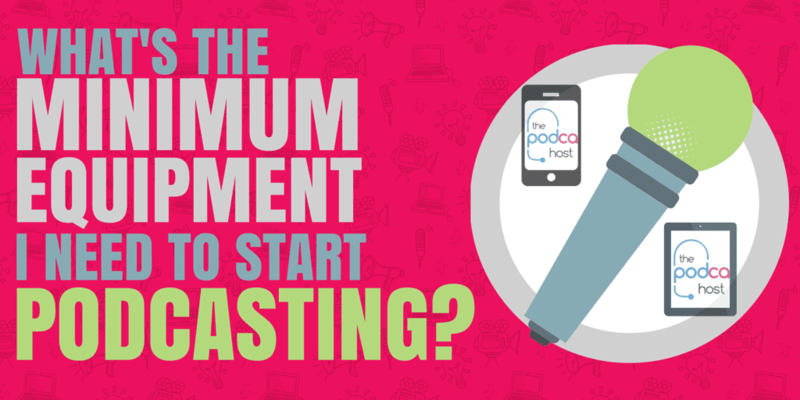 Many aspiring podcasters have asked us if there’s such a thing as a “podcast starter kit”. A one-box solution that’ll equip them with all the gear they need to start and run their show. This is a great idea in theory. But unfortunately it isn’t an overly-practical idea. There are many different types of podcast out there, and certainly no single box of equipment could be referred to as a “starter kit” for them all. Aside from the different formats of podcast out there, other important factors that determine equipment are things like location, environment, motivation, ambition, and budget. To give a one-size-fits-all recommendation for every podcast would have the majority of podcasters spending much more than they need to. What Else do I Need to Podcast? We’ve covered a few different options for how you can go about recording your show, but there’s just a couple of other things we’ll need to run a podcast. Audio software. Firstly, the good news is that Audacity is completely free, and will allow you to both record and edit your audio. You need audio software if you want to make any edits to your recording, or if you want to add in intro or outro music. Learning to use Audacity can take a bit of time and patience, but it’s not hard once you grasp the basics. If you’re looking for a shortcut to mastering Audacity, we have a course inside our Academy that’ll help you do just that. Thanks to our new “podcast maker” tool Alitu, you don’t even need audio software like Audacity anymore though. Alitu is really simple to use, and will take care of the processing, editing, and publishing of your podcast for you. It’s ideal for complete beginners who don’t want to learn how to edit, or experienced podcasters who don’t have time to edit! Call recording software, IF you’re doing an interview show with remote guests. If that’s your aim, check out our roundup of the best tools for recording a podcast online. Media hosting. A media host is a website you sign up to and start uploading your episodes. Once you’ve created your show on a media host, people can subscribe to it and start downloading your content. For more on media hosting check out Where do Podcasts live? So if you’re asking “which media host should I choose, and how much will it cost?” then check out our recommended media hosts. There’s an option there for every level and budget! Need More Help Starting Your Podcast? Hopefully you’ve now got a better idea of the options that are available to you. It doesn’t need to be expensive, and it doesn’t need to be complicated. If you’re still looking for some in-depth info on the other aspects of planning and launching a show (content, episode formats, finding music, cover art, etc) then I’d suggest checking out our guide on How to Start a Podcast. That’s our Premium Site, where you’ll find access to all of our tutorials, ebooks, downloadable resources, and courses. The courses range on everything from voice training and presentation skills, to promotion, audience growth, and monetisation. This is a really helpful article – thank you! Which of the Android-compatible option(s) is/are best if you want to pick up high-quality audio of both you, the interviewer, and the the interviewee? The lav mic is appealing but I’m guessing it will only pick up the audio of the interviewee wearing it, and passing it back and forth would defeat the purpose of creating a seamless interview experience. Hey I want to thank you for taking the time to post this. It’s intelligently written, well-organised, and easy to understand with lots of great specific information and no fluff. I know this sounds like this was written by your PR guy, but honestly, after all the trash I’ve had to wade through to get a few simple answers this is a breath of fresh air — thanks again. Does audacity help with recording skype calls? Since the basis of the podcast I’d like to do is discussions over skype/facetime this is something that I need and I’m having a hard time finding something that will do the job as cheaply as possible. Hi Sarah, a much simpler way is to use one of these tools to record your shows https://www.thepodcasthost.com/podcast-interviews/best-tools-for-recording-a-podcast-online/ I’ll definitely need to add this link into the article. I started a podcast about a month ago, and I have a couple of people running the tech stuff for me, and we’re working out of their studio, but I may have to do it myself, and recording from home, soon. They claim it usually takes them a day to edit and then upload it, I think using “archive.org”. Would I be able to get the shows uploaded to iTunes and other platforms quicker, if I were to use Libsyn and Blubrry instead? Or does that matter? The reason I ask, is because we’re offering news on all/various subjects and I feel the quicker, the better in most cases. As Archive isn’t a “dedicated” media host, and you’re also not paying them, they can be a little less reliable. If you can find just $5 a month to get on Libsyn it’s absolutely worth the reliability and peace of mind. Hello Matthew. Love your “too the Point” style. Question: Does Lavalier Mircophone work off of a Laptop?? Won’t recording quality increase over an iPhone??? Hi Neal, it really depends on the laptop’s soundcard as most lavs connect with a 3.5mm plug (the same as a standard pair of earbuds) so don’t have their own audio driver.